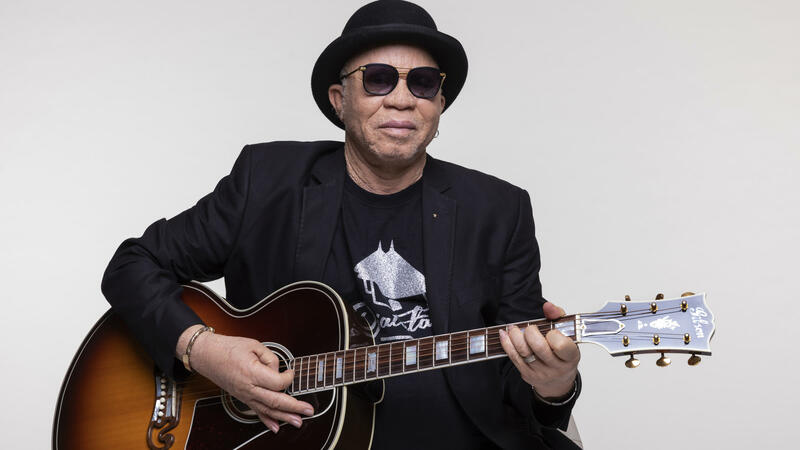 Salif Keita, one of the best African singers of the past century, had a 40-plus-year career that took him around the world and produced some 25 albums. Now, Keita is retiring from recording and in October 2018, he released his final album is Un Autre Blanc, or Another White. In 1987, Keita introduced an iconic voice to the world with his album Soro. Keita sang to his father, a master hunter in his native village in Mali, "O, Sina, your son is lost far away from home." Living then in Paris, Keita may have felt lost, but he was also finding himself. As someone born an albino to a royal family, his early choice to become a singer was both taboo and an act of courage for a young man who considered himself an outcast. After years of singing in urban African bands, Keita made his own statement and launching a movement of modern African music. All these years later, Keita returns to the studio with confidence, passion, pride, gratitude and still, that incredible voice. The song "Were Were" praises the great leaders of Africa, from Lumumba to Mandela and is the grandest subject Keita addresses in the album. The album title "Another White" is more personal. It refers to Keita's albinism, a defining feature of his life that he has sung and spoken about often. The album's title, Another White, meanwhile, is more personal and refers to Keita's albinism, a defining feature of his life that he has sung and spoken about often. Many of the songs are also about the virtues and hardships that women face in Africa. In the song "Itarafo," Keita and Afropop star Angélique Kidjo sing about a woman resisting pressure to abandon her child as she joins a new household. For his farewell recording, Keita invited a rich cast of African singers to contribute. On the song "Gnamale," he weaves in the vocal polyphony of Ladysmith Black Mambazo, mixing Bambara and Zulu in praise of Mande hunters like his late father. Keita ends this album with a serene reggae number thanking God for his blessings and warning those who misuse his name. This plays as a sly jab to Islamic fundamentalists currently destabilizing Mali and it perfectly encapsulates the complexity that has made all Keita's work so satisfying over the years. Never content with simple formulas, always breaking new ground, always authentic and sincere, Keita is himself a blessing. If this truly is his last recording, his creative force will be sorely missed. Salif Keita is one of the best African singers of the past century. His 40-plus-year career has taken him around the world and produced some 25 albums. Now Salif Keita is retiring from recording. Banning Eyre has this review of what Keita calls his final album, "Un Autre Blanc," "Another White." SALIF KEITA: (Singing in foreign language). BANNING EYRE, BYLINE: Salif Keita's 1987 album "Soro" introduced an iconic voice to the world. Keita sang to his father, a master hunter in his native village in Mali - oh, Sina, your son is lost far away from home. Living then in Paris, Keita may have felt lost, but he was also finding himself. Born an albino to a royal family, his early choice to become a singer was both taboo and an act of courage for a young man who considered himself an outcast. After years of singing in urban African bands, Keita was making his own statement and launching a movement of modern African music. EYRE: All these years later, Keita returns to the studio with confidence, passion, pride, gratitude and still that soaring voice. KEITA: (Singing in foreign language). EYRE: This song, "Were Were," praises the great leaders of Africa from Lumumba to Mandela. It's the grandest subject Keita addresses here. The album title, "Another White," is more personal. It refers to Keita's albinism, a defining feature of his life that he's sung and spoken about often. But many of these songs are about the virtues and hardships that women face in Africa. ANGELIQUE KIDJO AND SALIF KEITA: (Singing in foreign language). EYRE: Here, Keita and Afropop star Angelique Kidjo sing about a woman resisting pressure to abandon her child as she joins a new household. Keita has invited a rich cast of African singers to contribute to his farewell recording. On the song "Gnamale," he weaves in the vocal polyphony of Ladysmith Black Mambazo, mixing Bambara and Zulu in praise of Mande hunters like his late father. EYRE: Keita ends this album with a serene reggae number, thanking God for his blessings and warning those who misuse God's name. This plays as a sly jab to Islamic fundamentalists currently destabilizing Mali, and it perfectly encapsulates the complexity that has made all Keita's work so satisfying over the years. Never content with simple formulas, always breaking new ground, always authentic and sincere, Salif Keita is himself a blessing. And if this truly is his last recording, his creative force will be sorely missed. KELLY: Banning Eyre is senior producer for Afropop Worldwide. He was reviewing "Un Autre Blanc" by Salif Keita. KEITA: (Singing in foreign language). Transcript provided by NPR, Copyright NPR.